Colgate is so generous to send us this black box with their new line of Colgate products - Colgate Total Charcoal Deep Clean that comes and Colgate Slim Soft Charcoal Bristle toothbrush. As a coffee lover, I need frequent professional mouth care from the dentist. It also includes using oral care products that provide deep clean. About a week ago, a box that comes with the new Colgate Charcoal Deep Clean arrived home. I was ecstatic to try it and see the difference. To be honest, we are using the other brand. Sometimes different brands of toothpaste. Who doesn't want a pretty, bright smile? This is one of the first things people notice in you - your smile, your teeth. My tooth, the central incisor (wow! just trying to be professional, lol) has discoloration due to trauma. The dentist said there's nothing to worry about, the stain is reversible by using a whitening toothpaste. I admit, I did not take it too seriously. Besides, I still consume more than a cup of coffee a day, no wonder why it's still the same. I'm fine with that, it's not really a big deal as long as I have a clean, fresh breath all the time. Colgate Charcoal Deep Clean comes in white paste with grey stripped said to contains ultra micro charcoal particles. It comes in an easy to use tube and convenient pop lid so you don't have to worry about removing and putting back the lid. Indeed, Colgate Charcoal provides 12 hours protection. Even my husband noticed the effect. Not so bad breath the next morning compared when using a regular flouride toothpaste. It is effective against caries, gingivitis, plaque, calculus buildup, bad breath and reduces bacteria up to 90%. 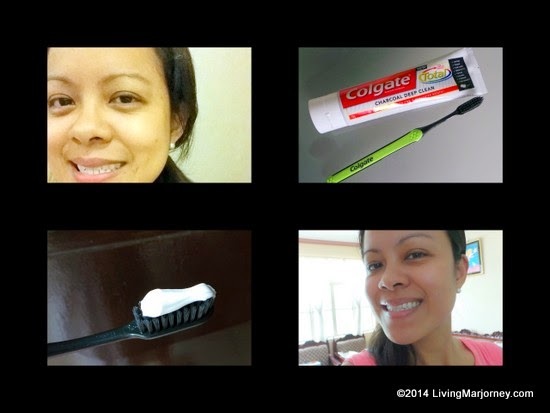 Colgate reduces the formation of plaque compared to regular flouride and gel toothpastes. Moreover, it's safe and effective. Surprisingly, it has non-irritating flavor unlike other brands which has too much mint. Colgate Charcoal Deep Clean cares for our gums and tongue and is said to be effective in preventing teeth staining. Same as the Colgate Charcoal toothpaste, I love the new Colgate Slim Soft Toothbrush charcoal bristle. It's ultra soft and has slim tip bristle that cleans even the hard to reach gums and teeth. The black color bristle has comfortable ergonomic rubber handle for a better grip. The bristle may look hard but it's actually soft and works well in between teeth. I wanted to brush my teeth more often. With Colgate Charcoal Deep Clean and Colgate Slim Soft Charcoal Bristle, I'm confident because of its long-lasting antibacterial protection. I really felt my mouth, fresh and clean! I personally bought this product. I'll be using this after I'm done taking pictures of the toothpaste. I'm also excited to try this. I love the brush too because it cleans better than the hard brushes.